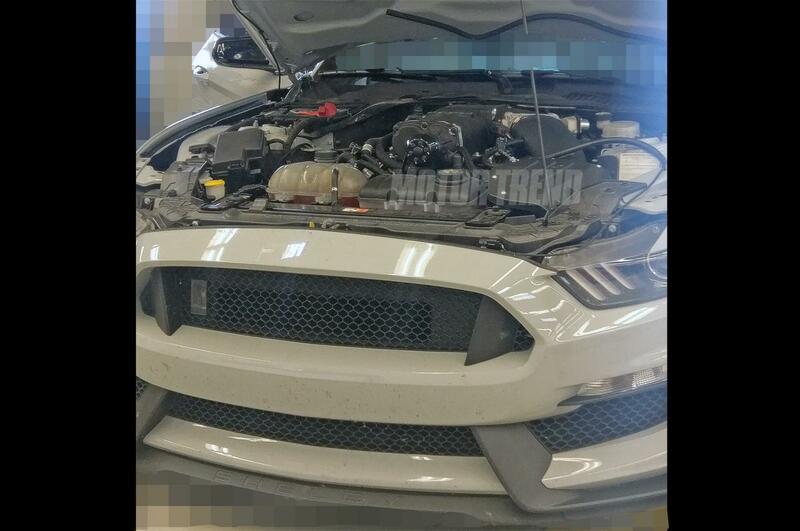 A source close to MotorTrend photographed a supercharged V8 engine under the hood of a Shelby Mustang. Reported on extensively by our friends at Mustang6G, they are claiming that it is a blown version of the same 5.2-liter Voodoo V8 used in the Shelby GT350 – a 5.2-liter flat plane crank engine fitted with a supercharger. The source further claims that this car is a mule for the upcoming Shelby GT500. MotorTrend notes that the supercharger install looks very clean, as if it is OEM, and the accompanying parts (blower, etc.) resemble the Ford Performance supercharger kit for the Mustang GT. There is speculation that Ford may just simply be testing an OEM supercharger for the GT350; however, us car enthusiasts prefer to think that the spied car is indeed a Shelby GT500 mule. When asked about the photograph, a Ford spokesman said the company doesn’t comment on speculation. The Ford Performance supercharger kit for the Mustang GT is estimated to produce 670 horsepower when mounted to a 5.0-liter V8. This gives great potential for the 5.2-liter Voodoo, which already makes 526 horses and 429 lb-ft of torque in a naturally-aspirated environment. Considering that the former Shelby GT500 put out 662 horses and the current Camaro ZL1 makes 650, you can only assume that Ford is going to come out swinging again. 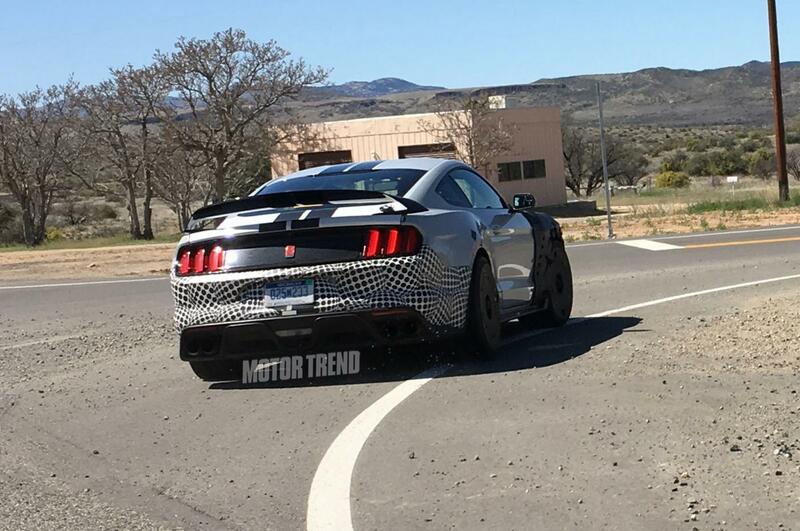 A possible Ford Shelby GT500 Mustang test mule was recently spotted near Prescott, Arizona. Motor Trend reported that Ford engineers were testing the camouflaged vehicle in the vicinity of a Mercedes AMG media drive. Once again, we are unsure as to whether it was indeed a GT500, however it wore a Shelby badge on the rear decklid, bringing attention to the GT350R wing on top of the trunk. Sources stated that the engine note was in fact comparable to that of Ford’s 5.2-liter Voodoo V8. As far as anyone can tell, neither the GT350 nor the GT350R are receiving an update for 2018, and both are believed to be discontinued after next year. An important side note: the suspected Shelby GT500 mule was spied testing alongside a Chevrolet Camaro ZL1, which boasts the supercharged, 650-horsepower V8 from the Corvette Z06. It is therefore safe to assume, at least, that this is a supercharged GT500 is in the works to compete against its muscle rival. The Shelby GT500 celebrates its 50th anniversary this year, so a new model debut is definitely possible. Despite the fact that Ford has not officially made any comment on a possible upcoming and new GT500, there has been a rise in discussion. A number of people in the industry have been speaking out on forums about the return of the GT500; these people have predicted the return of the GT350 in the past. As you may recall, recent photos of a “future GT500 Mustang” have surfaced with features not found on previous models. Images obtained by a member on the Mustang6G.com forum show a possible prototype obtained from inside a Ford Motor Company facility. Until declared otherwise, many are calling this high performance Mustang prototype the 2019 GT500. This particular prototype first showed itself last summer as it ran in and out of Ford’s test track. The video allows us to assume if is either a 2018-19 Shelby GT500 mule or a refreshed 2018 Shelby GT350. 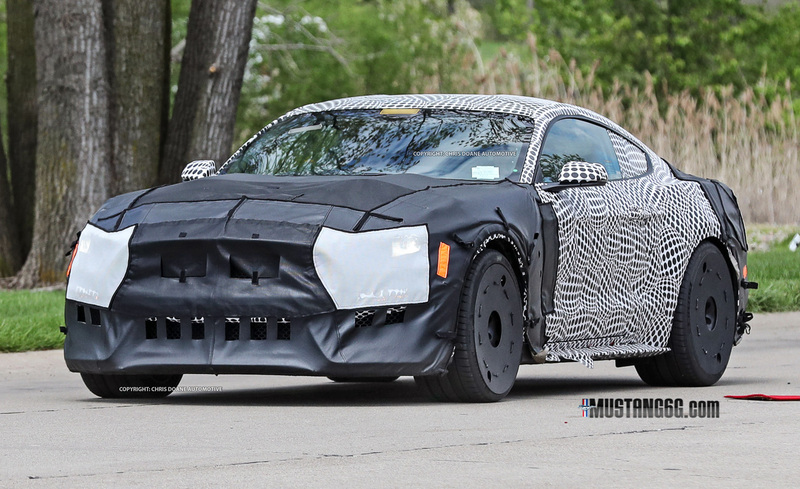 Although nothing is concrete, there have been a growing number of spy shots and speculative posts about a 2019 Shelby GT500. Ford is one of those automakers that is very in tune with its consumer audience and that makes us believe that they will listen to us again. Do you think a 2019 Shelby GT500 will smack down the Chevrolet Camaro ZL1 and the Dodge Challenger Hellcat? Comment your thoughts below!